The spotlight is definitely on the traditional definition of “Entrepreneurship” – identify a problem, build a startup, fund a startup and turn it into a miraculous Unicorn, however, we want to put some pressure on this definition and introduce a second – “Entrepreneurship Through Acquisition“. He purchased a failing scaffolding manufacturer that was $1 million in debt. He had the vision and saw the potential. 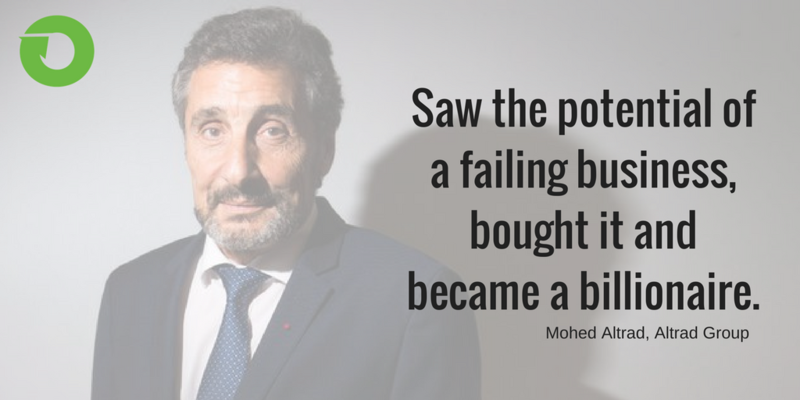 The Altrad Group is now a global leader and he’s worth $1.6 billion dollars. 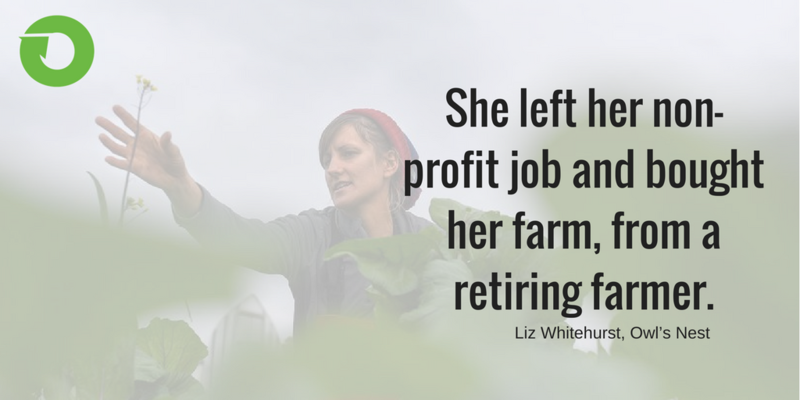 Two years ago, she left her non-profit job and bought her farm, Owl’s Nest Farm, from a retiring farmer. Now she grows an array of organically certified produce and sells to restaurants, through CSA shares, or at local farmers markets. In 1981, Schultz visited a client of Hammarplast, a fledgling coffee-bean shop called Starbucks Coffee Company in Seattle, curious as to why it ordered so many plastic cone filters. He was impressed with the company’s knowledge of coffee and kept in contact over the next year, expressing interest in working with them. A year later, he joined Starbucks as the Director of Marketing. On a buying trip to Milan, Italy, for Starbucks, Schultz noted that coffee bars existed on practically every street. He learned that they not only served excellent espresso, they also served as meeting places or public squares; the 200,000 cafés in the country were an important element of Italian culture and society. On his return, he tried to persuade the owners to offer traditional espresso beverages in addition to the whole bean coffee, leaf teas and spices they had long offered. After a successful pilot of the cafe concept, the owners refused to roll it out company-wide, saying they did not want to get into the restaurant business. 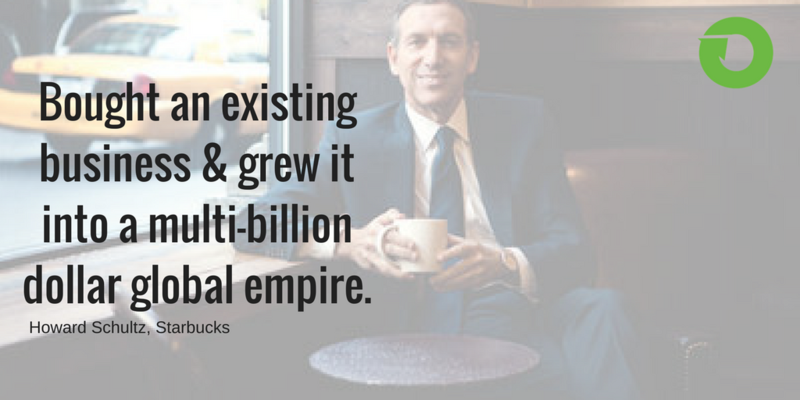 Frustrated, Schultz decided to leave Starbucks in 1985. He needed $400,000 to open the first store and start the business. He simply did not have the money and his wife was pregnant with their first baby. Jerry Baldwin and Starbucks co-founder Gordon Bowker offered to help. Schultz also received $100,000 from a doctor who was impressed by Schultz’s energy to “take a gamble”. By 1986, he had raised all the money he needed to open the first store, “Il Giornale”, named after the Milanese newspaper of the same name. The store offered ice cream in addition to coffee, had little seating, and played opera music in the background to portray an Italian experience. Two years later, the original Starbucks management decided to focus on Peet’s Coffee & Tea and sold its Starbucks retail unit to Schultz and Il Giornale for US$3.8 million. Schultz renamed Il Giornale with the Starbucks name, and aggressively expanded its reach across the United States. 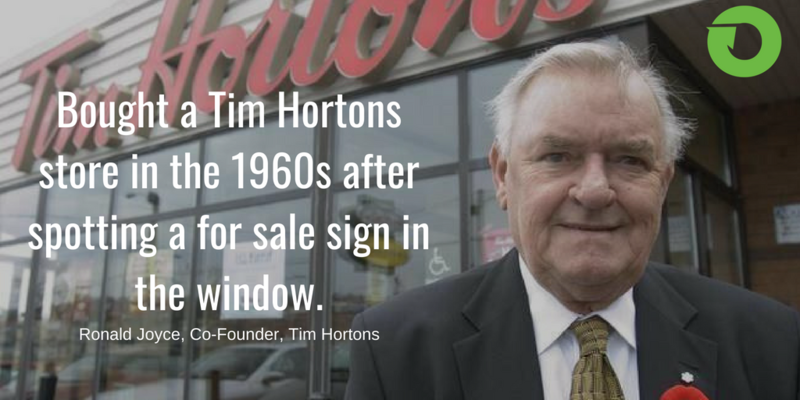 Ronald Joyce bought a Tim Hortons store in the 1960s after spotting a for sale sign in the window. He became a full partner in the business, then bought Horton’s shares from his wife after he died in an accident in 1974. Today he is worth $1.3B. Originally purchased as a restaurant, the acquirers turned it into one of the most luxurious resorts in Thailand. He visited a restaurant in San Bernardino, Calfornia. After his visit, he became convinced that the concept and design of this small chain had the potential to expand across the nation. He’s credited for purchasing, popularizing and founding McDonald’s! Create your own inspiring story of entrepreneurship through acquisition by clicking here.